Stephanie's Stampin Spot! : Get Well MOM! 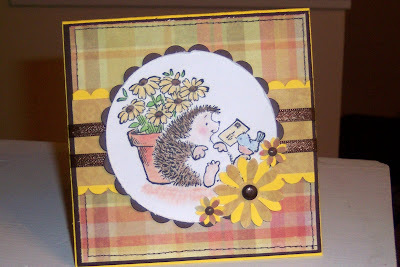 I made this card for the Penny Black Challenge this weekend, this is for my mom who is suffering with shingles really bad. Just trying to send her some cheer. I really do hate working with circles but this one turned out ok.. I love this Penny Black stamp called "message from above". Hope you are having a good Saturday, it is a rainy one here in South Carolina. This is adorable and I know she'll love it. Hope she gets better soon. Oh, Stephanie, this is adorable. I love this stamp and you colored it beautifully. It is sure to cheer your mom up. Hope she gets well soon! A lovely card and I'm sure it will cheer you mum up - hope she gets better soon. Love this card Stephanie! it's really cute and the image is adorable!! Sorry to hear about your mom dealing with the shingles. I hope your card cheers her up & that she gets over this very soon!!! Ouch - I hope your mom is better soon. Our 25 yo son had a bout with them in January. No fun. How's the weather in South Carolina? Our son graduated from Coastal Carolina and we miss escaping our cold to visit him! Very cute. Sorry to hear your mom is not well. Shingles are such a terrible thing to have. Hope she's feeling better soon. So cute! Love that image! Aww its a lovely card and beautiful colours. Its sure to cheer your Mum up! Hope she's feeling better soon. I love hedgies. I too, used to hate working with circles but don't mind a bit now I have the nesties! Beautiful card Stephanie, oh love the papers and fab image ~ your mom will love it. Wishing her a speed recovery. Gorgeous card Stephanie - love your cute image and lovely colur scheme. Hope your mum is feeling better soon. Thanks for joining in the PBSC this week. Fabulous cute card. Hope you Mum gets better soon. What a lovely card am sure she will love it and it will bring a smile to her face. Lovely colours and papers.